We’re in the middle of February, and it’s a good time to ask this awkward questions – how are your New Year’s Resolutions? Easy, we don’t want to check your results correctly, because it’s not difficult to guess that some of you just gave up the decisions. But let’s get deeper through it – maybe the problem is that the effects tracking method were wrong? Never miss any receipt again and stay perfectly organized with the costs! Expensify is dedicated and designed primarily for business travelers and professionals, but I know l a lot of people (myself included) who use this app to track personal expenses. The app allows to scan the receipts (the details are fully readable thanks to SmartScan Technology), categorize, tag them and add to the particular group. Worth giving a go – start saving money in a smarter way! It’s one of the most frequently used calorie counters at the moment. My Fitness Pal works in an easy way – just add your weight details, and this app will recommend you a daily calories intake. According to this results, users can track their meals and exercises by adding entries to the food diary and activity log. Each day is presented in a detailed report divided by the breakdown of fat, proteins, and carbs. My Fitness Pal is packed with the searchable food database of more than five million items which grows continuously. You’re even allowed to add your products if they’re missed in the app. Isn’t it perfect for tracking your weight loss progress? The beginning of New Year is the perfect time for quit smoking, drinking alcohol or doing other harmful things. Some of the people just want to start to live healthier and need supervision. That’s why Habit Bull was invented – to help them stick to the new goal! It may seem to be quite weird, using a mobile app to quit phone addition, but trust us – it works perfectly! Thanks to Flipd you can lock your smartphone for a fixed period. This app works in two different modes depend on your vulnerability to distractions. First, The Casual Lock, as it’s described on their website, permits you to leave the lock screen but reminds you to come back when you do. And the second, Full Lock might be scary for the highly addicted users because it “removes” all the downloaded apps from the phone and enables the special screen. But don’t worry, you still can send a message or call someone if needed. Managing time without being distracted sounds incredible, doesn’t it? The easy and intuitive task manager with gesture-based interface – isn’t it great? With 30/30 you can enjoy the productivity improvement. It works in a simple way: you work for 30 minutes, focusing just on a single task and then you can give your mind a break for the rest of an hour. After a complete cycle, you’re ready to start another with a fresh piece of energy! It may seem unrealistic. However, the app allows you to set your period dedicated to working and break, from one minute to one hour. The app is completely uncluttered, so you don’t have to be afraid of being distracted by the additional buttons. What is more, if you don’t want to create a strict work/break pair, you can set your schedule. Struggling with New Year’s resolutions doesn’t have to be a real battle if you have allies around you. Productivity improvement is closer than you think – just download these five amazing apps for your Android or iPhone and watch the new you! 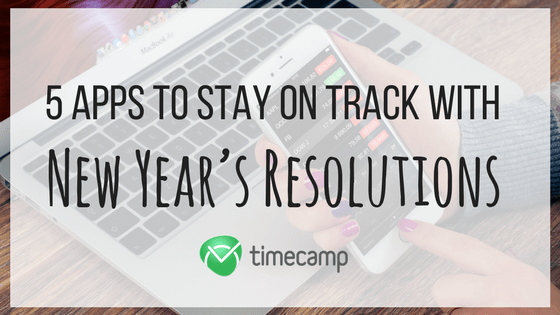 You can also download TimeCamp for tracking time spent on sticking to New Year’s Resolutions!